Déborah Cherenfant could easily be described as an entrepreneurial dynamo. This energetic young woman has more than one iron in the fire and doesn’t hesitate to forge ahead! 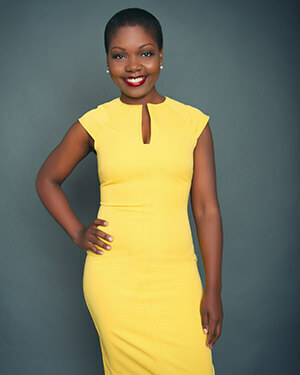 Pursuing her two passions, entrepreneurship and fashion, in 2005 she moved from Haiti to Québec to continue her studies at HEC Montréal. In 2011 Déborah Cherenfant didn’t know much about the business world in Québec; she looked around for inspiration and found it. She began to write a blog called Mots d’Elles—the first of its kind in Québec— focusing on women in business. Telling other women about female role models in business and successful projects carried out by women, she quickly became a source of encouragement for many readers. Still going today, this platform—which has earned many awards and distinctions including “best business blog in Canada” —profiles women in business. After starting Mots d’Elles, this “entrepreneurial dynamo” gradually began to give talks about ambition, leadership and female entrepreneurship to CEGEPs, universities and organizations. To give back to her community—in a society where immigrant women are underrepresented—and following her keen interest in fashion, Déborah Cherenfant decided to launch her own business of fashion accessories and design, founding Coloré Design in 2012. She hires only immigrant women and produces locally. The business has held many successful fundraisers for organizations whose missions share her values such as the Fondation KANPE, which promotes economic independence for families in Haiti. In 2015, Coloré Design produced Marché Coloré, a new kind of boutique featuring pieces by designers who share a passion for patterns, textiles and colours. Déborah Cherenfant has done volunteer work since she came to Québec. She was involved with Habitat for Humanity, which was building houses in the Dominican Republic. She also worked with UNESCO, representing Haiti as a youth leader at the Caribbean summit on transatlantic trade. In addition, in 2015 she represented Canada at the G20 Summit of young entrepreneurs in Istanbul, Turkey. Since then, she has sat on many boards of directors, among them that of the Jeune chambre de commerce haïtienne, and in 2016 will be Chair of the Board of Companie F, entrepreneurship au féminin. Always focused on action and women’s empowerment, Déborah Cherenfant is planning to set up a production workshop to promote leadership and employability among women who are in the process of vocational reintegration and are living in precarious conditions. Knowing how far this woman of distinction has come, it’s a pretty good bet that this project will see the light of day!